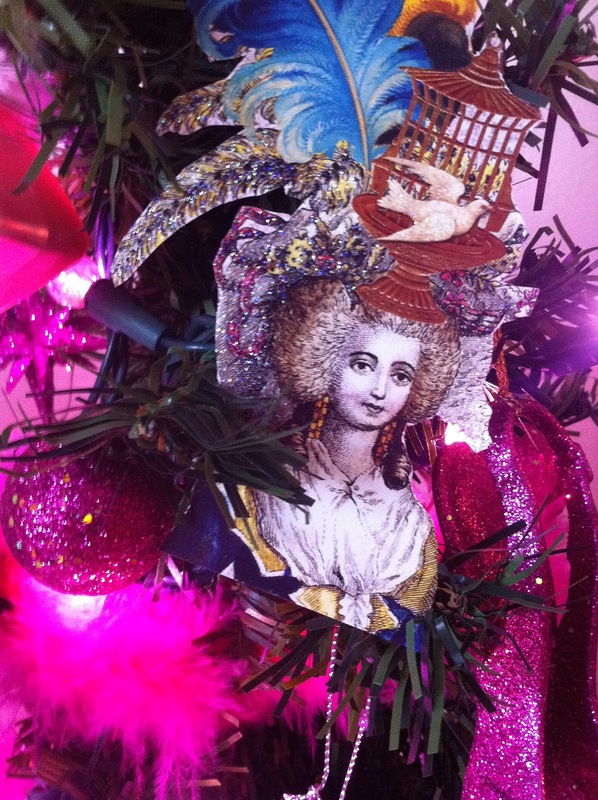 As a treat for you, my beloved blog-follower, I have gathered together a plethora of Marie Antoinette related treasures available on the open market. Get ready to click your Amazon Universal Wish List Button. Here comes 'Tis the Season Part Two! A Pillow On Which to Rest My Shopping Weary Head - Long lines, mad mobs, rainchecks, rude cashiers, pushy salesmen. Living the life of a Royal Shopper is exhausting, especially during the Holidays. Although it is not the most revolutionary idea ever shared, I would like to offer you a suggestion. Why not take a rest, recline your head upon a charming, down-filled pillow? 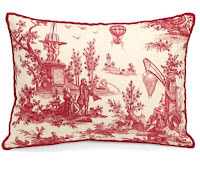 Pierre Deux has the most romantic little Marie Antoinette Toile Pillow featuring a whimsical pattern based on an engraving of Versailles. Before you click the link above, let me warn you. The $195 price tag might cause you to scream, "Sacre Bleu!" Sure, it is a lot of money for a single 22x16 pillow, but don't you deserve it? Heck, don't we all deserve it? I wholeheartedly belive that if everyone in the kingdom had been issued a charming Marie Antoinette pillow, the mob would not have stormed Versailles and the queen would never have lost her head! Not convinced by my pillow points? 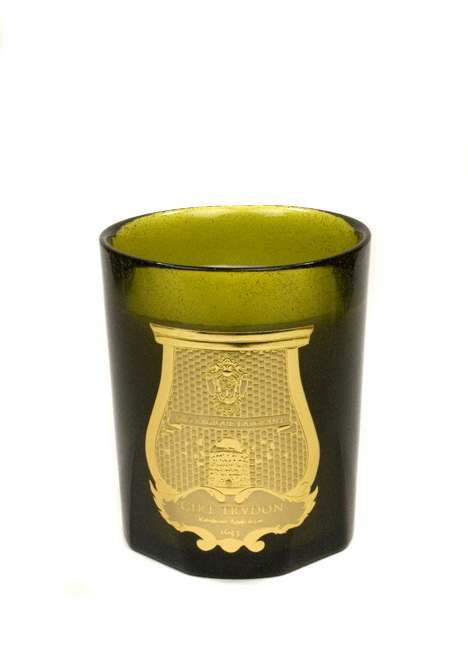 Still reluctant to part with your few francs? Angry I would even suggest such a radical idea? Easy there Robespierre! Before you storm the Bastille, here's a more affordable alternative. I found this fab French fabric store several years ago and am pleased to tell you they sell a Marie Antoinette toile for only $41/yard. If you are handy with a sewing machine, you could whip yourself up two pillows for much, much cheaper than the lovely Pierre Deux pillow. No offense to old Pierre, but few of us are willing to blow our grocery budget on a pillow. Bread and cheap chic, is our motto! Christmas is for the Dogs - When I saw this next item, my delighted squeal prompted my pampered poodle-schnauzer mix to arise from her satisfied slumber upon my lap and gaze longingly at the computer screen. The Precious Palaces Marie Antoinette Walnut Pet Bed by Beyond the Crate is...well...precious! 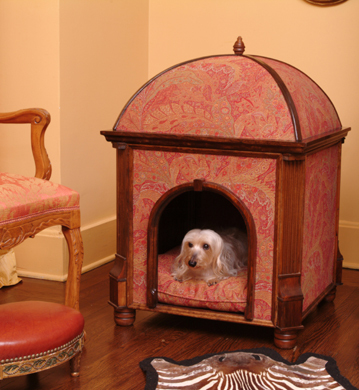 This classy canine cot was replicated in the style of the kennel used for Marie Antoinette's beloved chiennes. Yawn! Why Do I Have to Get Out Bed? 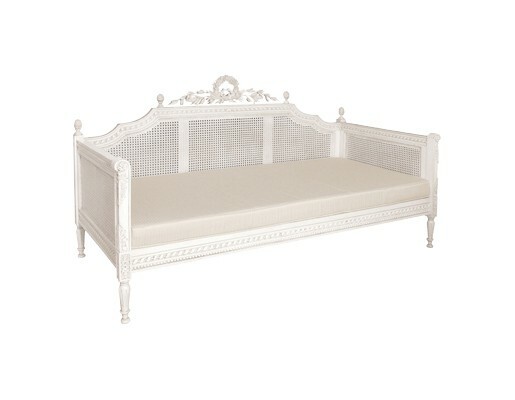 - Lounging in luxury should not be a privledge reserved merely for dogs. 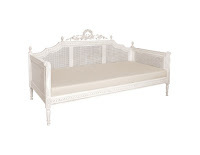 With the Chateau Marie Antoinette Daybed you too can know what it is like to slumber in a bed that is a replica of one once used by the Queen. "Now, where are those macho Swedish Palace Guards and why aren't they peeling me a grape?" she purrs, stretching seductively. Gee Antoinette, Why So Stone Faced? - This 4 foot tall stone bust is being offered by Cote Antiques and would look marvelous, darling, in your foyer. I do! I do! I really do! - Many young women dream of the day they will get married. Long before they have found Mr. Right (or, even Mr. Willing), they rip pages of out bridal magazines and mentally draft their guest list and menu. Twenty years ago, I was one of those young women. I tore pages out of bridal magazines (I was torn between a fruffy, princess gown with a wide skirt and long train or one that was sleek with an art deco vibe) and mentally planned my menu (fondue because I thought it would be fun). A year later, I met Mr. Right. And a year after that, we eloped. I wore a sundress and we ate cajun chicken near the beach. No princess gown, no cooing white doves, no bridesmaids in pink. 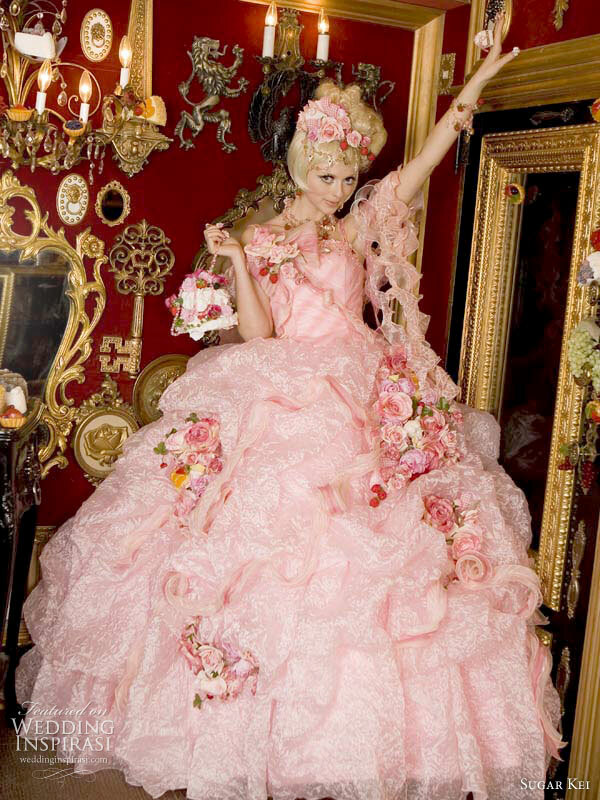 If I were young and wishful, I would hope for a destination wedding set at this chateau in the Loire Valley and I just might wear the Marie Antoinette inspired Sugar Kei Sweet Gown. 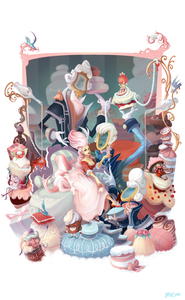 A Modern Masterpiece - This delicious print depicts Marie Antoinette surrounded by a wonderful world of sweets and would look positively tasty framed and hanging in your kitchen or even your dressing room. This is an original piece of art. You can purchase it signed by the artist. For those of you just beginning to nurture your passion for Marie Antoinette, here are some fabulous books about the life and times of the queen. Such wonderful treasures if only we could all have these delights!